Seventeen brand-new stories by some of fantasy’s most imaginative authors about children born with the gift of magic- whether in our world or in fantastical universes. 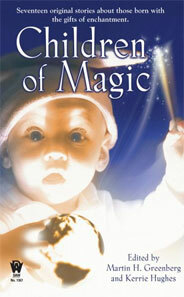 These young spell casters use their powers–for good or ill–to transform their worlds to their liking. From a fledgling wizard with political ambitions, to a boy whose touch can end suffering, to the “true” tale of how Da Vinci came by his talents, these are wondrous excursions into both the light and dark sides of magic.